Probably one of the most well known and reliable spring cabbages. Cabbage 'Durham Early' produces firm, pointed, well flavoured hearts on compact plants. This compact variety also be sown or planted closely for delicious 'spring greens' ready to harvest from February. Height: 30cm (12"). Spread: 35cm (14"). Sow direct outdoors July to August to overwinter for a spring harvest. Sow at a depth of 13mm (1/2") and distance 23cm (9") between rows. Water cabbages regularly, particularly during dry periods. Hoe between plants to prevent weeds from establishing and bring insect larvae to the surface. Draw earth up around the base of each stem to prevent wind rock and improve the plants stability. Harvest in late summer or the following spring once the heads have matured. 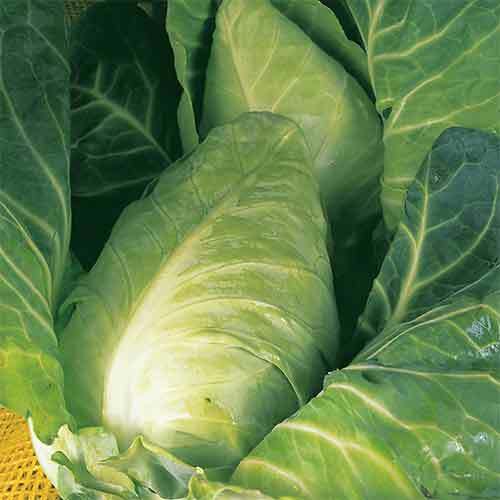 Vitamin rich cabbages are high in iron and potassium, but also low in calories. Try growing cabbages with nasturtiums draw cabbage white butterflies away from your crop, and mint to help deter flea beetles.